During this procedure, the Eclipse MicroPen® is used to create controlled micro-injuries to the skin in order to naturally produce collagen and elastin. The skin’s repair process results in improvement of the appearance of softer wrinkles. 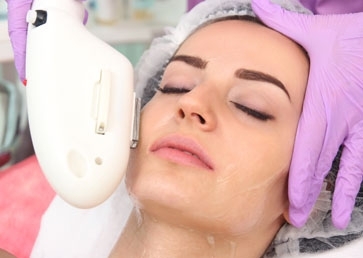 Automated micro-needling also creates superficial micro-channels which can be used with topical gels, creams and serums to help improve the appearance of the epidermal layer of the skin. After the process is completed we then infuse a growth factor serum into the micro-channels through the skin. What aging skin really needs are growth factors. The research shows that growth factors have the potential to increase collagen production and improve wound-healing, among other improvements. A sterile cartridge containing 12 tiny micro-points is attached to the Eclipse MicroPen®. Your skincare professional will apply a thin layer of topical gel to your skin and select the appropriate treatment setting based on your unique needs. Unlike lasers, Eclipse MicroPen® breaks up pigment mechanically and stimulates the collagen formation without heat. Removing heat from the equation makes for a safer, more comfortable treatment with a very low complication rate.